Here’s the programme, we hope it’s kinda unlike much you’ve seen before. But above all it’s an experience, especially for those who know that there are possibilities for film beyond narrative cinema, for sound beyond tunes and who want to be inspired, enriched or confounded by a night out. Abstract, flickering forms. A kind of celestial examination of tiny detail and uncanny motion, or tricks of the eye, or maybe even just the phenomenology of the eye, what it can see and understand in time. All grounded within the sounds of everyday life, the bustle of open spaces, pissed off car park attendants, the thrum of ventilation ducts. I’ll try and tell you, although I wouldn’t want to spoil it: a sort of quasi-theatrical, multi-projector and possibly slightly chaotic, (at least in appearance), investigation of audiences’ expectations. 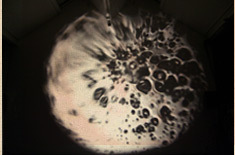 Bruce turns projectors into instruments; he doesn’t project film, he misuses it. 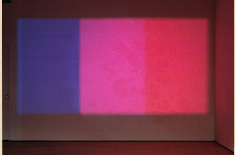 His bastardised 16mm projectors cut B&W loops into a thrumming 3D riot of perceptual phenomenon in colour, motion and sound. 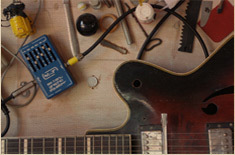 Maybe it’s noise music for the eyes, burnt on to your retina. 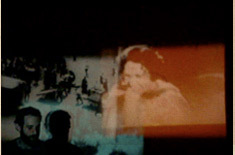 Using eight projectors, Metamkine manipulate and combine beams of multiple images, ghosts of old films, abstract glimpses, often developed, solarised and burnt as they pass through the projector, in the midst of an electro-acoustic sound field of tape loops, analogue synthesizers and amplified objects. What’s not to love? 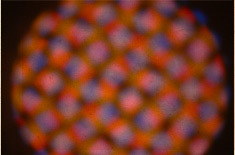 In Light Trap film loops are abraded with sandpaper and scratched by gem polishing drills as they pass through projectors in each corner of the room. 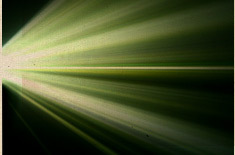 Out of a dark haze, shafts of lights are picked out, as the emulsion is scratched from the surface of the film. 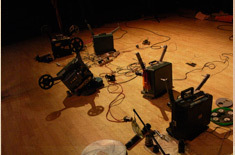 And simultaneously, out of the black silence, noise and audible scratches bloom into a bright drone. It’s not really an installation, or like a normal performance, it’s just an experience of real beauty.